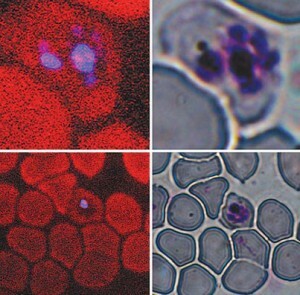 The optical effect called third harmonic generation causes malaria secretions to glow blue in infected blood cells (left), promising a faster, more efficient diagnosis than traditional microscopy imagery (right). The traditional wisdom on malaria: quick to contract, slow to detect. A new invention, however, promises to change at least part of the malaria rulebook by giving the disease a colourful makeover. Technicians currently detect malaria in the clinic by staining slides of blood smears with giemsa dye, which marks the DNA of the malaria parasites. They then painstakingly examine the stained blood samples under an optical microscope. The process is laborious—technicians manually count all the visibly infected blood cells to determine if the count exceeds the detection limit—and requires a very specific skill set. A research team led by Paul Wiseman of McGill’s Departments of Physics and Chemistry, however, has developed a faster, more user-friendly technique. The new process relies on a known optical effect called third harmonic generation; THG causes hemozoin, a crystalline substance secreted by the malaria parasite, to glow blue when irradiated by an infrared laser. In a study published in Biophysical Journal, the researchers say the new technique could eliminate the need for specialized training, slides, staining and microscopes—spelling the welcome end of a labour- and time-intensive process. Moreover, the faster a person is diagnosed with malaria (first symptoms don’t appear until 10 to 15 days after infection), the faster they can get treatment; early treatment not only prevents complications, it dramatically reduces the risk of death. Each year, upward of 500 million people contract the malaria parasite—principally spread by the female anopheles mosquito—and one to three million die from the resulting disease. Most of the fatalities are concentrated in sub-Saharan Africa, where diagnosis is often stymied by a dearth of trained personnel and equipment. The disease is also found in parts of Asia, Europe, Latin America and the Middle East. This research is funded by the Natural Sciences and Engineering Research Council of Canada, the Network of Centres of Excellence—Canadian Institute for Photonic Innovations, CFI and CIHR.